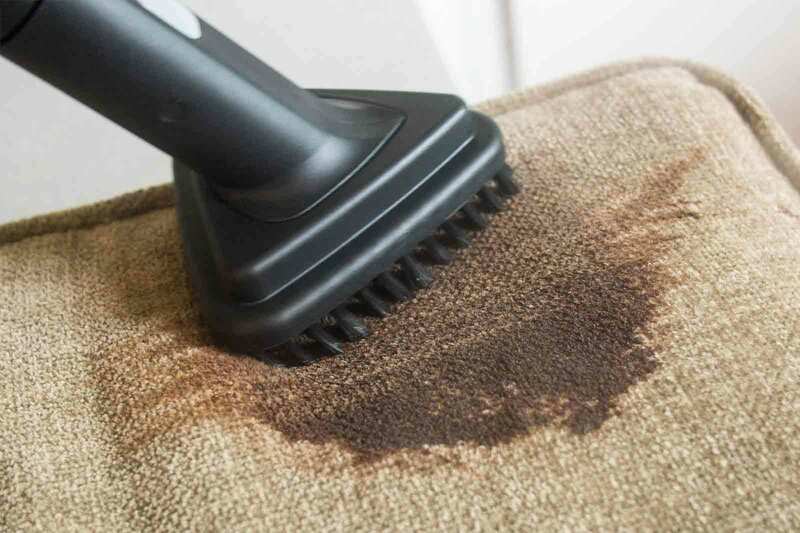 Use these machines to spot-treat stains on furniture, carpet and the interior of your car. After 25 hours of research and six hours spent cleaning wine, chocolate sauce, and coffee off a grimy couch and a white shag rug, we think the Bissell SpotClean Pro is the best cleaner for spot treating carpet and upholstery. It removed stains better than four of the top-selling portable cleaners we tried. It's affordable and easy to use, and runs little risk of damaging your fabrics or carpets. The machines we cover in this guide are really only good for spot treating upholstery fabrics (including car interiors) and carpets. If you need to revitalize an old couch, make an antique rug look brand-new, or disinfect a bug-infested piece of furniture (which requires temperatures above 130 °F), you really need to hire a professional cleaning service. Carpet and upholstery cleaning can be broken down into three categories: deep cleaning, routine cleaning, and spot treatment. This guide focuses on extraction machines and steam cleaners designed for spot treating stains and blemishes. Extraction machines, like our two favorite cleaners from Bissell, rely on hot tap water, cleaning formula, and suction to lift stains. They usually don't have a heating element or pressure mechanism. Steam cleaners—including canister steam cleaners, upholstery steam cleaners, portable spot cleaners, vapor cleaners, and carpet cleaners—feature internal heating elements that heat water to steam temperatures (ideally, boiling point) and force it through a pressurized nozzle. The steam lifts soil and stains, which you can then wipe away with a cloth or towel. For all of the machines we looked at, we considered water tank capacity, the number of attachments, suction, and wattage. For our fabric tests, we used a small, cheap white shag rug and a couple cushions from an old couch. We doused them in Hershey's chocolate syrup, a heavy cabernet red wine, and dark roasted coffee, and then we tested how well each of the cleaners pulled up the stains from the cushion fabric and rug. We tallied the results and tested for convenience, ease of use, portability, and safety. 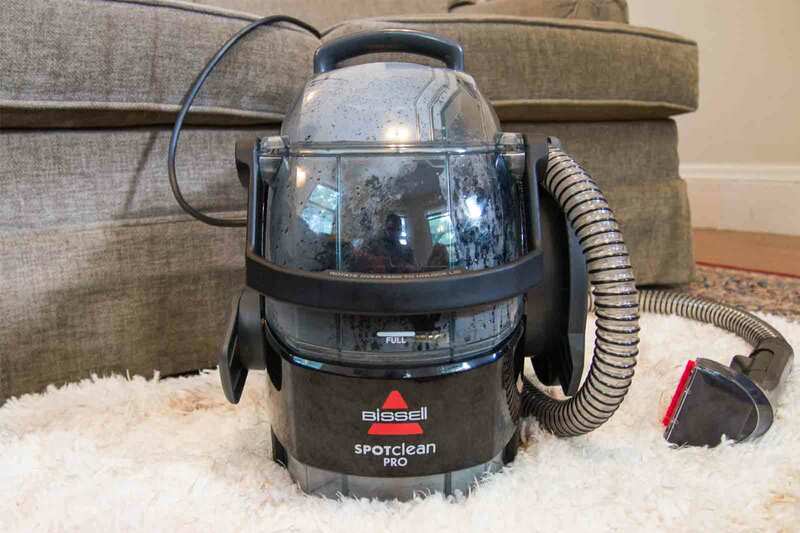 The Bissell SpotClean Pro is the best carpet and upholstery spot cleaner we tried. It was one of the only machines to completely remove stains from upholstery and it did a better job at minimizing stains on our white shag rug. It's less likely to damage fabric than a steam cleaner, cheaper than most competing devices, and fairly easy to use, with very few safety hazards. To be honest, we were shocked at how well the SpotClean Pro performed. After testing three high-powered canister steam cleaners that all proved more or less useless in the stain-removal department, we did not expect this hot-water extraction machine to do much (especially considering that none of the pros we spoke to recommended it). We wouldn't go so far as to say the SpotClean Pro could compete with professional services, but it certainly performed as advertised, lifting some very heavy stains to near completion. Rather than merely scattering the soils like the steam machines did, the SpotClean lifted stain particles and removed them with the vacuum. In our upholstery test, it powered right through chocolate syrup, red wine, and coffee to the point of the upholstery looking almost brand-new. Because the SpotClean Pro's heat is limited to whatever your tap can produce you run little risk of damaging your fabric—and little risk of burning yourself (unless your tap water is preposterously hot). We still recommend checking out the cleaning code on your furniture's tag before using the SpotClean Pro, because some types of upholstery are not meant to be used with cleaning solvents. Our complaints about the SpotClean Pro have nothing to do with performance and everything to do with usability. It comes with only two tool attachments: a 3-inch stain tool and a 6-inch stair tool. 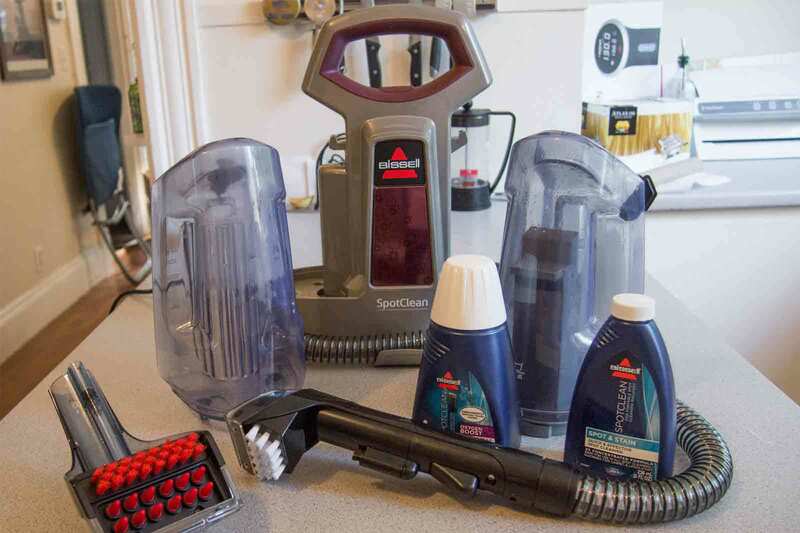 Seeing as the SpotClean Pro is meant to be used on only carpet and upholstery, this is probably enough—and we certainly didn't feel like anything was missing—but two tools is less than the 12 or 13 different nozzles and tools that come with canister steam cleaners. 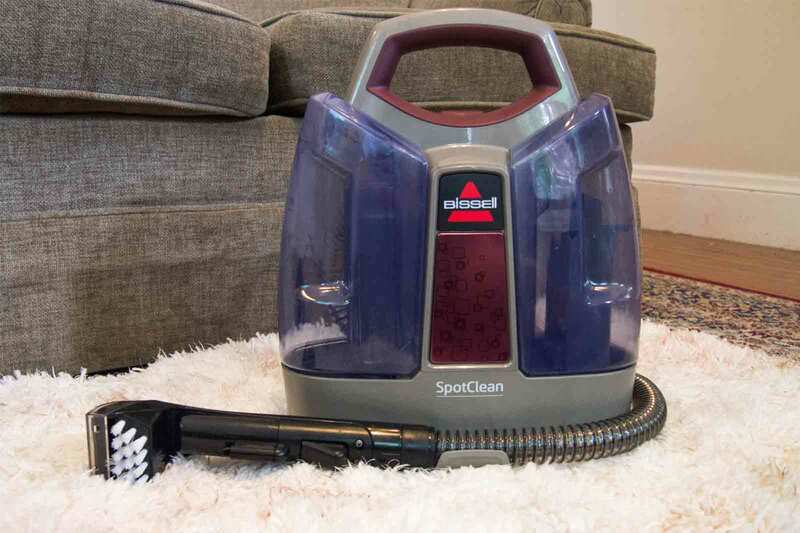 The SpotClean Pro's little sibling, the SpotClean, also performed very well in our tests. The Pro was a bit better at removing stains, but seeing as our stains were particularly heavy, we imagine this smaller SpotClean would offer comparable performance in most cases. It isn't quite as versatile as the Pro, given its smaller water tank (37 ounces), shorter power cord (15 feet), and shorter hose (3½ feet). You'd need to fill the tank more often. Also, this model comes with only one cleaning attachment compared with the Pro's two. But it costs roughly $30 less than the SpotClean Pro at the time of writing. 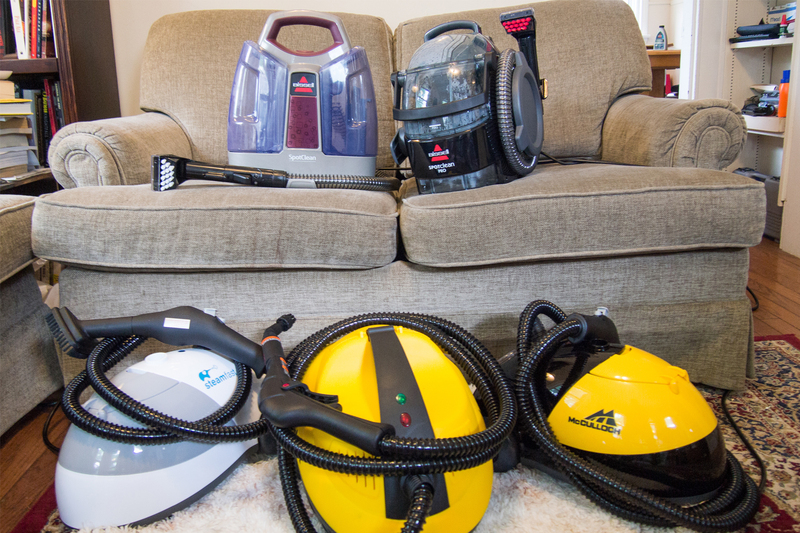 It outperformed all of the canister steam cleaners we tested—and by a long shot. We even preferred some of the SpotClean's operational components, as it's about two pounds lighter and features a water inlet that's on top of the tank, rather than below it. If you're going to use a spot cleaner only a few times a year, we'd probably go for this model. One difference between this cleaner and our main pick is that is that the smaller SpotClean has what Bissell calls "heatwave technology." This keeps the hot tap water at a constant temperature, but it doesn't heat the water to steam temperatures. The SpotClean Pro, which doesn't have this feature, did just as well or better at picking up stains, even as its water cooled.